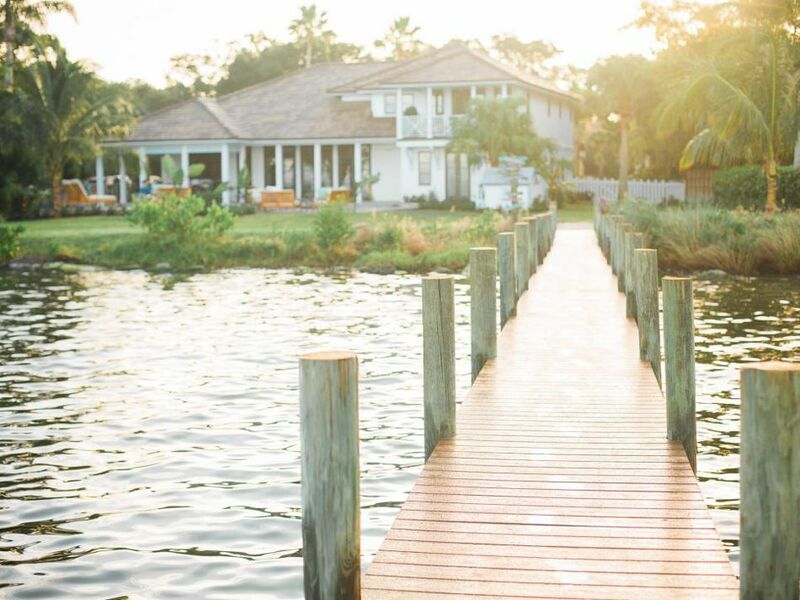 The 2016 HGTV Dream Home is a two-level, 3,100 square-foot home on the banks of the Indian River in Merritt Island, Florida. The home was renovated by HGTV to be given away in a sweepstakes running from December 29, 2015 through February 18, 2016. With the 2016 Dream Home, HGTV's goal was to take full advantage of its tropical surroundings and to create a casually elegant haven that blurs the lines between the home's indoor and outdoor areas. The result is a cozy three-bedroom, three-bathroom house with stunning views, a dock and boat house, and a lovely outdoor living area including a dock, a boat house, and a sparkling pool. The Dream Home is decorated in cool neutral colors accentuated with tropical Floridian colors like corals and turquoises. Keep reading to learn more about the special features of this luxurious home. Where Is the 2016 Dream Home Located? The 2016 Dream Home is located in Merritt Island, Florida, which is home to about 35,000 families. Merritt Island is Florida's largest island, on the eastern side of the peninsula, facing the Atlantic. It's famous for being the home of the Kennedy Space Center, where the space shuttles were launched. Even if you're not familiar with the name "Merritt Island," you might have heard of Indian River oranges and grapefruit, which are grown there. Merritt Island is a paradise for anyone who loves the water. It features acres of white sandy beaches, lots of water sports like kite surfing and fishing, and more. Merrit Island has lots of interesting things for families to do. Aside from swimming, fishing, and sun bathing, the Kennedy Space Center has a ton of activities for space enthusiasts, from dining with an astronaut to simulating a space shuttle takeoff. And with a little bit of driving, all of the fun of Florida will be at your family's disposal, if you are the HGTV Dream Home's winner. Disney World is just an hour away. On the mainland, there are a huge variety of lakes, wildlife sanctuaries, and parks. HGTV has a series of photos of the Dream Home's surroundings on their website. What's Different About the 2016 Dream Home? Unlike the previous Dream Homes, HGTV did not build the Merritt Island home from scratch. Instead, they did a complete renovation of an existing home. The 1990's-era, Mediterranean Revival-style home was completely gutted and remade in a Caribbean style, with the goal of connecting the indoors with the stunning outdoor areas of the Dream Home. The redesign included creating an open floor plan which still had clearly designated areas for the kitchen, dining room, and living room, adding two new bathrooms, and adding balconies to the master bedroom suite. In addition, the roof was extended to create room for an outdoor kitchen/patio and all of the windows, floors, insulation, and roofing was redone. Another thing that makes the 2016 Dream Home different from previous years is the design team. The previous 19 HGTV Dream Homes have been designed by Jack Thomasson with the interior design created by Linda Woodrum. But in 2016, the Dream Home took a different direction with a new design team. Who Designed the Dream Home 2016? The style of the 2016 Dream Home was created by television producer and interior designer Brian Patrick Flynn. Brian Patrick Flynn, who also helped design the apartment home given away in the 2015 Urban Oasis Sweepstakes. He is known for pairing bold colors and patterns, which made him the perfect person to create the Caribbean vibe of the 2016 Dream Home. You can see some of Bryan Patrick Flynn's favorite things about the 2016 Dream Home in this 90-second video tour from the HGTV website. Michael Stauffer, a local architect, was responsible for creating the "bones" of the gutted-and-renovated 2016 Dream Home. He planned out how the renovations could work to achieve goals like blurring the lines between the indoor and outdoor areas, creating more usable living space, and making the home more comfortable to live in. You can watch a video that shows how Michael Stauffer planned out the 2016 Dream Home on the HGTV website. Steve Price was the builder in charge of putting architect Michael Stauffer's plans for the 2016 Dream Home into place. Of course, even the experts stumble across unexpected problems when they start renovations. You can watch how Steve Price handled some of the problems with the Dream Home renovation in this video from the HGTV website. How Is the 2016 Dream Home Laid Out? The 2016 Dream Home has two levels. The lower floor is by far the biggest, and it includes the living areas and two bedrooms. There are two entrances at the front of the home. Visitors can enter through the front courtyard and proceed through the elegant foyer into the rest of the home. The family can also park in the spacious garage and enter through the mudroom. The main area of the Dream Home has an open layout, but the living room, dining room, and kitchen are differentiated by ceiling height changes, area rugs, and different lighting elements. You can see more in this 90-second Dream Home tour on the HGTV website. The media room is between the dining room and kitchen, and it's enclosed to make a cozier space and to reduce noise. There are also two bedrooms on the main level, each with its own bathroom. The upper level is a cozy retreat for the lucky winners. The master bedroom and master bathroom are nestled up there, amid gorgeous views of the water. I love the idea that the owners can entertain guests laviously, but can also retreat to their own private living area to relax and unwind. What's the Master Bedroom Suite Like? Interior designer Bryan Patrick Flynn describes the 2016 master bedroom as "the most bold-colored room in the house" in his Master Bedroom Tour on the HGTV website. The muted teal color of this room lightens the formal design to make it feel more fun and playful. The 2016 master bedroom is large enough to sport two separate living zones: a sleeping zone, dominated by a fresh white four-poster bed, and a "lounging zone" with a sofa perfect for curling up with a good book. The wall facing the river is lined with windows to maximize the views, including windowed French doors leading out to the master balcony. Mirrors opposite the windows do even more to bring the outdoors in. To relieve the bold colors of the master bedroom, the bathroom is painted in shades of white, with teal highlights to add splashes of color. in a departure from many bathrooms, the shower is enormous, a walk-in area with a bench and body sprays from the side as well as the overhead shower head. For those who prefer to soak, there is a deep, stand-alone Roman-style tub. To make getting ready in the mornings easier, there are huge his-and-her double vanities with tons of storage space. The 2016 Dream Home master bathroom also has its own balcony overlooking the water. See the Dream Home Master Bathroom Video Tour on the HGTV website to get a look for yourself. The 2016 Dream Home's master balcony is a private getaway where the future owners can unwind after a long day by watching the sun set over the Indian River. The balcony uses the same teals and whites that you'll find in the master bedroom and the master bathroom. It also includes a comfortable seating area, easy-to-maintain carpets, and Chippendale-style railing, which also matches the style of the staircase railing. See more in this HGTV master balcony video tour. Where Can Guests Stay When They Visit the 2016 Dream Home? HGTV's Dream Homes are designed for entertaining, and that includes room for guests to stay over. In the 2016 Dream Home, there are two bedrooms on the ground floor, and each has its own bathroom, so your guests (or your kids) won't have to share. Just steps away from the pool patio, the terrace bedroom has a gorgeous view of the water. The walls are painted a fresh, clean white, while the curtains, bedding, and other features use blue highlights to add relaxing color to the room. One of my favorite special touches in this room is a rope hanging chair that looks just so perfect for hanging out, reading a book, looking for leaping dolphins, or watching the boats come and go along the river. The blue and white theme is carried into the terrace bathroom, which pays homage to the nautical location of the 2016 Dream Home. There's no tub in this bathroom, but there is a spacious shower with a rain shower head and a built-in shelf for storage. The terrace bedroom and terrace bathroom pictures on the HGTV website show you more details of this beautiful suite. The Dream Home 2016's guest bedroom is designed to be a warm retreat for out-of-town guests. To achieve this, the walls and accents use a bright, terracotta color, balanced by neutrals in the area rug, flooring, and trim. The winner's guests will have plenty of room to spread out, courtesy of a walk-in closet and a three-drawer vanity/nightstand. There is also a desk for work or correspondence, a wireless sound system, and a flat-screen television. The guest bathroom tones down the color scheme, using whites and pale blues with a few terracotta touches to bring in the color from the bedroom. There is a nice shower/tub combo here, with a spa-inspired hand-held shower head. See the Guest Bedroom Photos and the Guest Bathroom Photos on the HGTV website for more details. How's the 2016 Dream Home's Kitchen? Like all of the river-facing rooms of the 2016 Dream Home, the kitchen has a bank of windows which boast amazing views and let natural light stream in. And the kitchen is designed to take full advantage of that light. Most of the time, you'll see the same color cabinets throughout a kitchen. But in the 2016 Dream Home, Bryan Patrick Flynn chose to go with a bi-tone color scheme. The bottom cabinets have a rich, brown color, while the top cabinets have a fresh, white color that glows in the light. A basket-weave marble backsplash that stretches all the way to the ceiling ties together the brown and white colors of the cabinets. The counter tops are made of quartz, which stays cool despite the Florida heat, and which glisten in the light. The kitchen has a large island with a sink and seating for four. I love the bar stools, which have low backs and plenty of padding to make them comfortable as well as functional. The white and blue-striped fabric picks up colors from the rest of the home. For those who love to cook, there are high-end appliances provided by LG. And if you're planning on entertaining, a door leads right out to the lanai, making it easy to bring hot dishes to guests on your patio. And storage space? Yep, the Dream Home 2016 has it covered. Not only are there a lot of cabinets, but deep, pull-out drawers mean that you can reach everything you need easily. But the Dream Home kitchen has done something else interesting with storage; they've placed three chests of drawers under the windows, to add free-standing storage space and a homey touch. See this Dream Home 2016 Kitchen Tour video on the HGTV website for more information. Where Can You Entertain Inside the Dream Home 2016? The main floor of the 2016 Dream Home is designed for entertaining. Aside from the kitchen, where people will surely gather at parties, there is also a comfortable living room and a media room where guests can hang out. The first thing that you're likely to see when you enter the 2016 living room is a huge, black-and-white photo from the 1970s of local surfers that makes up one entire accent wall. The dynamic photo adds energy to the room, goes beautifully with the color scheme, and is sure to be a talking point for your guests. If they can take their eyes off the water views, that is. The entire wall is made up of windowed French doors, with views out over the Indian River. To make your guests comfortable, there are two cozy sofas accented with throw pillows, plus two armchairs. A large, custom coffee table made of glass and rebar makes a perfect resting place for your books, magazines, or coffee mugs. See the Living Room Gallery on the HGTV website to check out this beautiful living area for yourself. The media room of the Dream Home is another entertaining space, a cozy room where your guests can gather to watch movies, play games, or chat in comfort. The media room is tucked between the kitchen and the dining room (making it easy to bring in refreshments). It uses neutral colors in the furnishings, but bright colors like shades of watery blues and hot pinks in the artwork and accessories. Two big sofas and fluffy occasional seating will give the winner plenty of space to chat with their guests. There is also a set of French doors leading out to the back patio of the Dream Home. You can see the room for yourself with this Dream Home Media Room Video from the HGTV website. What Are the Outdoor Features of the 2016 HGTV Dream Home? Many of the outdoor areas of the 2016 Dream Home face the Indian River. The front courtyard is an exception, but it's beautiful nevertheless. The courtyard is paved in light neutral tiles, and the entryway is framed by a flower-draped white picket fence. The front garden includes palm trees and luscious tropical flowers. It also has a subtle blue fountain surrounded by flowers. The future owners of the 2016 Dream Home can greet their guests at a pretty outdoor dining area with a sun umbrella and terracotta-colored seating. You can find images of the front courtyard on the HGTV Dream Home site. If you love to grill and entertain outdoors, the 2016 Dream Home is perfect for you. Underneath the extended roof that the redesign gave the Dream Home, the designers created an outdoor dining area called the lanai (another word for veranda). The extended roof provides shelter from the strong Floridian sun and from rain. It has its own professional grilling station with a stone surround and a refrigerator for drinks, comfortable wicker seating surrounding two separate tables, and ceiling fans to create a breeze on hot days. Check out the lanai for yourself with this gallery from the HGTV website. What would a home in Florida be without an outdoor pool? And here, the 2016 Dream Home doesn't disappoint. The 2016 Home has an extensive pool patio that looks out over the Indian River. It features a long, skinny pool that's designed to fit the area. The pool is surrounded by rough pavers that won't get slippery when wet, and which pick up the Floridian colors of the decor with subtle coral and grey-blue colors. There are also two separate sun lounging areas, with comfortable seating for chatting or sunbathing. And best of all, there's an outdoor shower to let you rinse off before going inside. See the Pool Patio Tour video from HGTV's website for more information. The HGTV Dream Home comes with a new boat, so of course, the winner is going to need a place to keep it. So of course, the 2016 home comes with a dock. A path leads from the pool patio out to the dock, which has a cute, custom directional signpost that points to previous years' Dream Homes as well as to the dock area. The dock is made from a rot-resistant composite material, and has built-in lighting to help you find your way at night. Watch the Dream Home Dock Tour on HGTV to see it for yourself. What Other Prizes Come with the HGTV Dream Home? Winning an amazing home worth over a million dollars would be a once-in-a-lifetime prize to begin with, but HGTV doesn't stop there. The 2016 Dream Home comes with many other attractive prizes as well. The 2016 winner will be sitting pretty in a new, 2016-model-year luxury SUV crossover. This car has enough room to seat eight people, and it comes with tons of incredible extras including a mobile 4G Wi-Fi hotspot, a heated steering wheel and seats that both heat and cool, a premium sound system from Bose, and much more. The winner will also receive a pile of cash: $250,000, in fact, provided by Quicken Loans. This money can be used for taxes, paying off debt, treating yourself, or whatever else you please. What would be the good of having a house on the water without having your own boat as well? HGTV will furnish their 2016 winner with a 2016 Bryant Sperenza model boat worth over $57,000! Again, whichever option you choose, you will also be the owner of the interior furniture and artwork, selected by designer Bryan Patrick Flynn and provided by Ethan Allen. If you win and don't take possession of the 2016 Dream Home, you can decide whether to keep the furniture, sell it, or donate it to help offset your taxes. After notifying and verifying the winner, HGTV will treat them to a weekend at the Dream Home. Usually, HGTV films and photograph's the winner's reaction to their amazing home, and treats him or her like royalty while they're there. The Winner Weekend is currently scheduled for April 14-17, 2016. How Can You Win the 2016 Dream Home? The 2016 HGTV Dream Home offered two different ways to enter, online and by mail. The 2016 Dream Home gave entrants the opportunity to enter online up to twice daily, once on HGTV.com's Dream Home site and once on DIYNetwork's Dream Home site. There was also the option to receive one bonus entry total for entering online through Realtor.com. For those who didn't want to enter online or who wanted to enter more often, there was a mail-in entry method. Entries could be sent by mailing a postcard or a piece of paper no larger than 8.5 x 11 inches to: HGTV Dream Home Giveaway 2016, PO Box 51584, Knoxville, TN 37950. There was no limit to the number of entries that could be sent by mail. Entry was open only to residents of the United States who are above the age of 21. Entries closed on February 18, 2016. How Does HGTV Select Dream Home Winners? Each year, the Dream Home sweepstakes receives millions of entries, both online and by mail. How is it possible to fairly choose a winner among 90 million or more entries? HGTV handles the problem by separating the entries into batches, and then drawing the winner from among a specific batch. If the lucky batch comes from the mail-in entries, someone literally grabs an envelope out of a bin to select the winner. Winners are chosen from among the online entry batches by a random computer program. Read How HGTV Chooses Its Big Winners for more information. Who Runs the Dream Home's Winner Selection Process? HGTV does not administrate the winner drawing itself, to avoid any suspicion of conflict of interest. Since 1994, they have used an independent sweepstakes fulfillment company called Ritway, Inc.
Ritway has been in business since 1988, and their website claims they have processed over 750,000,000 entries for big and small companies including Coca Cola, Food Network, GAC, and more. Is There Any Way to Improve My Odds of Winning the 2016 Dream Home? As with any sweepstakes, there are some simple steps you can take to improve your odds of winning. Do your best to enter online every day at both websites to maximize your entries. Those entries are free, and only take a few seconds to complete. In recent years, some media outlets have talked about a loophole that could give you an edge over the competition. That "loophole" is really just taking advantage of the unlimited number of entries you can get by mail. While it's true that you can send in as many entries as you want by mail, remember that, unlike online entries, entering by mail will cost you money. The price of stamps and other supplies can add up, especially if you want to send in a lot of entries. And remember, you may be competing with nearly a 100 million entries, so the odds are going to be long no matter how many entries you send in. So before you plan on sending a lot of entries by mail, ask yourself if the price of sending in those entries will be worth it to you. If you do choose to enter by mail, remember that someone might be pulling your entry out of a bin by hand, so it might be worth having some fun and decorating your envelopes. When and How Will the 2016 Dream Home Winners Be Announced? How Will You Find Out If You Are the 2016 Dream Home Winner? If you're the lucky winner, the Dream Home rules state that you'll find out by "phone, e-mail... in writing, or in person." You might want to add "homepromotions@scrippsnetworks.com" to your safe senders' list in your email now, just in case. The rules state that the winner will be announced between March 21 and April 11, 2015. In recent years, HGTV has been informing their winners by staging an "ambush," where the winner is surprised by the news and their reactions are taped. For example, 2015 Dream Home winner Kathy O'Dell thought she was preparing a surprise for a friend who had won... only to find out that the big prize actually belonged to her. You can see photos of Kathy O'Dell's Ambush on the HGTV website. How Will HGTV Announce the 2016 Winner? The general public will find out who won the 2016 Dream Home through announcements on the HGTV website and through the media, which will be made on or about April 1, 2016. You can also request a winner's list by sending a SASE to HGTV through the end of June, 2016. The photos and videos of the winner ambush are usually aired on television and/or on the HGTV website. Is There a Downside to Winning the Dream Home 2016? In the United States, sweepstakes winners pay taxes on their prizes. And when the prize is as large as the 2016 Dream Home, those taxes are substantial. Some media outlets have even called winning the Dream Home a "financial nightmare" (TuscaloosaNews.com). And that's not even mentioning the significant costs of owning a Dream Home, including high utility costs, landscape maintenance, and more. So would winning the Dream Home be more trouble than it's worth? Absolutely not. Although every Dream Home winner until now has sold the home eventually, the entire experience is amazing. Aside from an amazing, much-hyped home to sell, the winner also receives a high-end vehicle, thousands of dollars in home furnishings, and more. The 2015 Dream Home sold for 2.315 million! In fact, 2005 winner Don Cruz, who lived in his Dream Home for a few years before being forced to sell, enjoyed the experience so much that he continued entering year after year, in the hopes of winning again. But even better, the 2016 Dream Home Sweepstakes offers the winner a cash option. If he or she doesn't want to keep the home or try to sell it, they can simply receive a lump-sum cash payout, along with the vehicles, cash, and home furnishings that come with the prize. With that cash payout, the winner can pay off their taxes and still have enough left over for early retirement, a more affordable dream home in their area, and more. So if you're willing to accept that the Dream Home will probably not be a home that you will live in, winning the sweepstakes would be an amazing, life-changing prize. See also: Could Taxes Spell the End of the Dream for HGTV Winners?